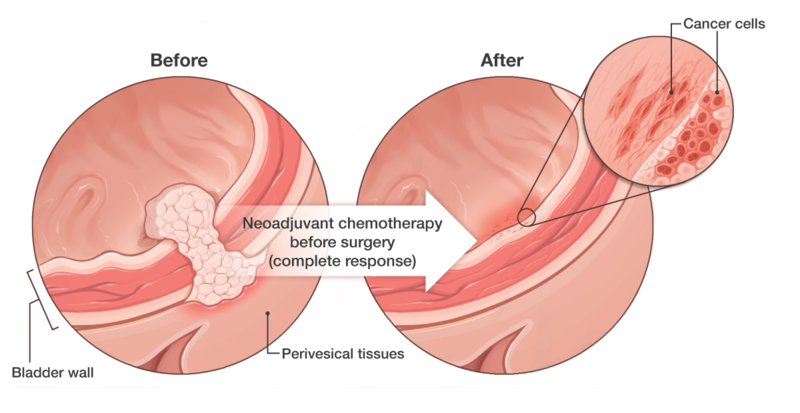 Neoadjuvant Chemotherapy delivers systemic chemotherapy before surgery. Intravesical Therapy confines the chemotherapy drugs to the bladder by placing the drugs directly into the bladder in order to kill any cancer cells that may remain after surgery to remove a tumor from the bladder, such as Transurethral Resection of Bladder Tumor (TURBT). Combined Modality Therapy is a treatment option for patients who are not able to undergo cystectomy due to other medical problems, or who choose to refuse cystectomy. This option preserves the bladder, rather than removing it, and combines systemic chemotherapy with transurethral surgery (such as TURBT) and radiation therapy. Adjuvant Chemotherapy delivers systemic chemotherapy after surgery. Shrinking the bladder tumor, making it easier for your surgeon to surgery to remove all of the cancer. Eliminating any cancer cells that may have escaped the bladder but cannot be seen on scans, called micro-metastatic disease. Patients whose cancer is confined to the bladder, who have adequate kidney function and hearing, and have no severe nerve damage, may be candidates for neoadjuvant chemotherapy. Studies show that neoadjuvant chemotherapy improves survival by up to 10%. The benefit may be even — up to a 40% greater cure rate — among patients whose cancer is nearly eliminated by the chemotherapy. Surgery is still essential, but the chemotherapy improves the results of the surgery. For this reason, all bladder cancer patients at Roswell Park are evaluated to determine if they are eligible to receive neoadjuvant chemotherapy.